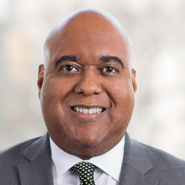 Principal Randy Hayman (Washington, DC) has been named to the list of "The National Black Lawyers - Top 100" for 2016 in the area of Energy, Environmental, and Public Utilities Law. Randy currently serves as the Co-Chair of the American Bar Association’s (ABA) Minority Trial Lawyer Committee, and he has served in leadership capacities on several bar and community organizations, including as Co-Chair of the Corporate Counsel Committee of the ABA Section of Litigation and as the Co-Chair of the Corporate Advisory Board of the National Bar Association. He formerly served as Metropolitan St. Louis Sewer District General Counsel and Missouri Assistant Attorney General. He also served on the Board of Directors of Washington, DC, and St. Louis Crime Solvers, and on the Board of Directors of the Herbert Hoover Boys and Girls Club in St. Louis. The Washington Business Journal presented Randy with its Minority Business Leader and Legal Champion awards in 2014. "The National Black Lawyers - Top 100" is an invitation-only professional honorary organization composed of the Top 100 Black Lawyers or Non-Black Attorneys that promote diversity from each state who serve individuals, families, and businesses needing attorneys to represent them in the American legal system. Members of The National Black Lawyers – Top 100 exemplify superior qualifications of leadership, reputation, influence, and performance in their area of legal practice. This exclusive organization provides superior networking opportunities, continuing legal education, and the highest quality advocacy training for lawyers across the nation. This organization is focused on highlighting and elevating the accomplished black attorney to provide the best way for the public and other attorneys to find the Top Black Attorneys for their legal needs and source for case referrals.